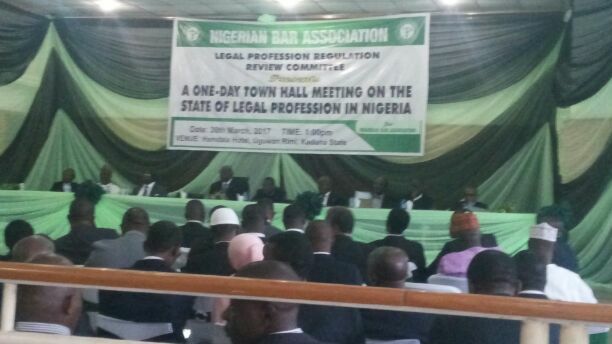 Nigerian Bar Association (NBA) on Thursday held a one-day town hall meeting on the state of legal profession in Nigeria specifically for legal practitioners and other critical stakeholders across the country. The event, which was held at popular Hamdala Hotel Kaduna with big wigs in legal profession in Nigeria in attendance, was aimed at identifying grey areas as it affect all aspect of the profession with a view to addressing them as soon as possible. In an interview with newsmen,Chairman NBA Legal Profession Regulations Review Committee, Chief Anthony Idigbe (SAN) said, they were in Kaduna for town hall meeting to receive feedback from lawyers and the public. “We want to hear from participants on how they think we can reform the regulations of legal Profession in Nigeria”. On the mandate of his committee he hinted that, the committee is set up to examine the regulations of the legal profession in Nigeria particularly, the regulatory architecture and the regulatory objectives. “To do the comparative analysis to best practices around the world, and if we find out that their are gaps, we would then make recommendations as to how the regulation of lawyers can be improved. And the modus operandi we designed was to vet a lot of feedbacks from both the lawyer as well as the key stakeholders concerned in this profession and the public who are the consumers of these laws. Commenting on recent face-off between acting Chairman of Economic Financial Crime Commission (EFCC) Ibrahim Magu and the Senate he said, there are checks and belances design in constitution that should be followed in the interest of justice and the country. He said, “you have constitution provisions that makes it possible for one arm of government to make certain decisions. So they call this separation of powers and checks and balances. “The intention of constitution makers is to avoid absolute power in any particular institution in Nigeria; be it from national assembly or presidency or even the judiciary. So in terms of how it is utilized in reality is the politics of it. “Conceptually, it is best practice for constitution to have separation of powers and checks and balances”, he said.